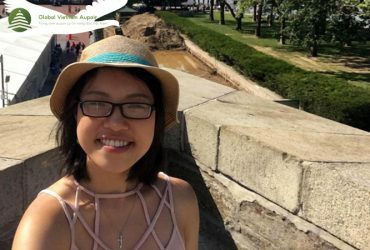 I am Oanh, currently I a 3rd year student at Western language and culturalt major, University of Language & International Studies, Vietnam National University, Hanoi. When writing these lines, it is time to recollect the time from last year. 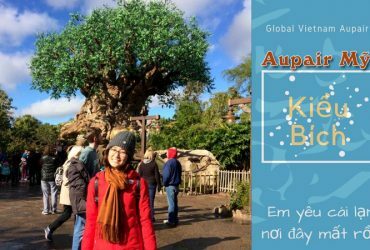 I just joke, actually it started in April 2013, when I prepared the plan to become a Aupair in Germany, after many deliberations, and introduced by my friend, I came to Ms. Thinh’s Global Vietnam Aupair. And I officially completed the record in mid-June 2013. Half year is not long time. But for me to say that is the most difficult time, passed the most emotional and also the most learning. and travel is my passion. Moreover, it is a European country. Finding out on the internet and going through the seniors, Aupair is one of the cheapest ways to live and study for a year in Europe. It is the cheapest to travel to Germany, France and other countries if possible. I decided to make it into reality. And when I come to the center, I get more at the instructor’s enthusiasm in the work. And the heart always wants to help the young have the opportunity to experience. My resume is fully prepared and begins the search for Gastfamilie. It can be said, it comes to me not really as simple as the other. 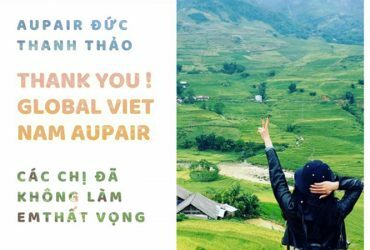 Normally my friends go to Global Vietnam Aupair and have 1 or 2 family send mail, want to talk, if both feel good together and we will make a deal. But not to me. Too many I can not remember correctly, about 8 families have contact with me. And to Gast’s 8th, the search for my new Gast stop and make the next step. But the reason is not her unprofessional or enthusiasm work. First of all, I can not arrange and decide the time to go to both schools. Add to that indecisiveness. Pondering to compare this family with another family and some objective reasons. As a result, it is impossible to choose a family from the beginning. Been discouraged and want to give up. I even cried when the family sent the contract but suddenly canceled. Or write letter many times to many families but are rejected. These are times when I feel very sad and bored, wondering why so difficult. But, my friends, what is the reason for my suitable family and have completed all procedures to prepare to fly today. Part of myself would definitely not give up. And I spend the rest for Ms.Thinh. My sister has been with me all the time. I feel myself, during her work. Maybe I am a customer that take the most her time and effort. Sometimes she was sad for her unprofessional in work. But she always encourage and give praise every time I try to do better. Some of families refused me. She tried to contact and continue to find the host family for me. She is the same person who has experienced the things that I and you are doing. So she understand and sympathize a lot. She always try to bring the best for the clients. Or say more simply and emotionally than to her siblings. Let them have the opportunities. I really like her. If not a person has the mind and passion for work, work with responsibility, not just for money, she did not leave such a memorable impression on myself. Because I am sad and desponded sometimes, she always sitting with me and analyze the positive aspects that we will have when spending a year to be Aupair in Germany. She gives me more motivation and I understand that nothing is easy. We must always try to cultivate ourselves. Moreover, I am the students who are learning German as the major in the university. She devoted to sharing and helping me until I has a new family. Me and my family talk and decide to chose together. Before the visa interview day. I and she still sitting to talk and share for hours in her office. She manuals details like sisters. I understand that is her job, if she do not, she will lose faith in the customer. But somewhere I still feel the heart of her, a desire to work and help others. By my thoughts, the cost we pay for her, it is not comparable to what she spent and we get after working with her. We need to be aware of this because I think it will be very useful for each of us in life and work later. From the smallest things like punctuality. How to write a letter expressing respect for the recipient or decisiveness in the decision to choose when the specific situation, I learned all that from her. Although not really deep but I have the foundation for my next steps. I always silently thanks her for helping me till this day. All my questions, doubts and omissions are answered. The benefits are guaranteed from the first step as basic document. Then I have the family cared, she instructed to write mail, chat via Skype with the family, signed a contract, complete the document, visa interview until the time of booking the air ticket. Everything is convenient and fast. I have interviewed Visa and wait for the day will go to Germany. I hope that you are passionate exploring new culture, like to experience and travel to Europe. Or simply want to improve your learning German in general and foreign language in particular. Try to be once in the Aupair position. I’ll be experienced and really eagerly. We all know that there will be many difficulties ahead, it will not be as simple as we think at home, homesick and some other sadness will follow you. And when you put foot and live in a house and strange country . But I believe if you always think optimistic, living well with people, we will definitely pass. And there is a very memorable time in life. 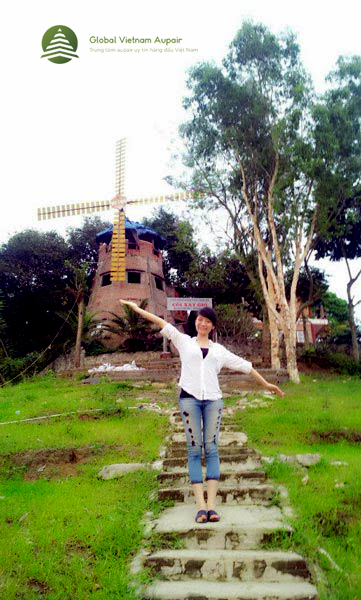 By the way, I wish Ms. Thinh will always be healthy, beautiful and more successful in work as well as life. Happy New Year with full of joy and happiness, good health to be companion with me and the other Aupairs, even when we are in Germany. 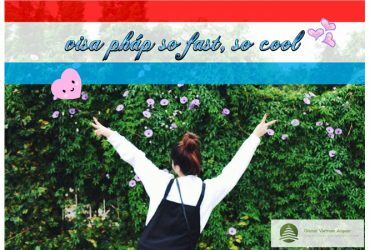 Wish the Global Vietnam Aupair Center will always hold the trust of students like us. I wish you are and will be Aupair many health and try the best on the way me and your chosen.